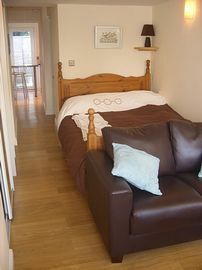 Situated on the ground floor the apartment accommodates two people (plus cot or blow up bed for a small child). Modern, light and airy, the apartment is decorated and furnished to a very high standard providing comfortable accommodation within very easy reach of the town centre and all its amenities. Parking is available free of charge to guests. The bedroom comprises double bed with lounge area with digital television and DVD player. Wireless (Wi-Fi) Internet access is also available free of charge. 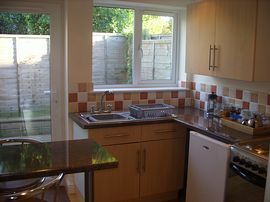 The kitchen is modern and well-equipped with breakfast bar, cooker, fridge, washing machine, cutlery, china and glassware. 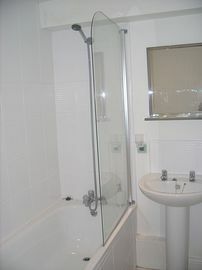 The bathroom is stylish and offers bath with shower over, lavatory and wash hand basin. 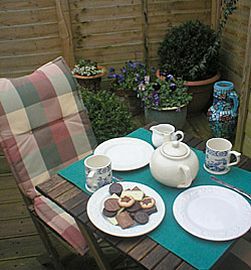 Outside, Boscote Apartment has a sunny, private decked terrace with table and chairs. It is a wonderful sun trap and allows you the opportunity to relax with a glass of wine at the end of the day! 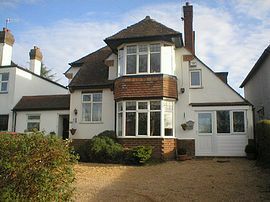 Excellent location just ten minutes walk in to town. Modern, fresh and airy ground floor apartment. 2009 Tariff (per night - minimum of 2 night stays - unless by prior arrangement). Check in time 3.00pm on day of arrival. Check out time 10.30am on departure day.